For at least 5 years, Billy and I have discussed ways to add shade to our back deck. 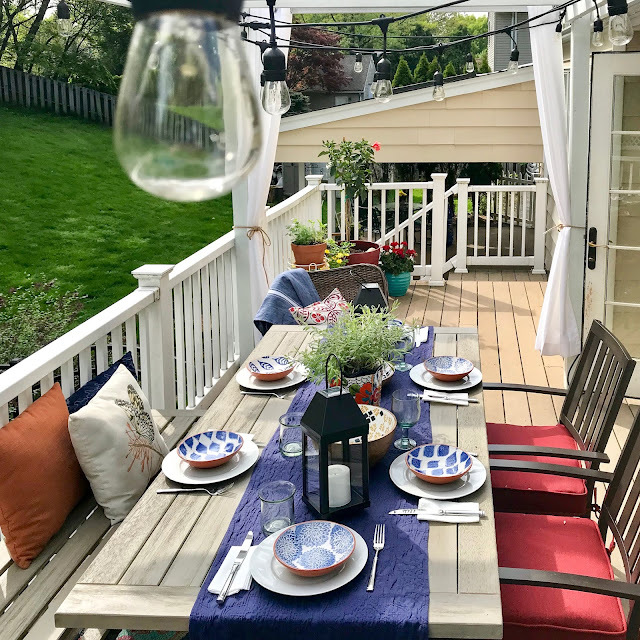 We added the small back deck, just large enough for a grill and a table for our family, many years ago because we enjoy eating outdoors in the summer. 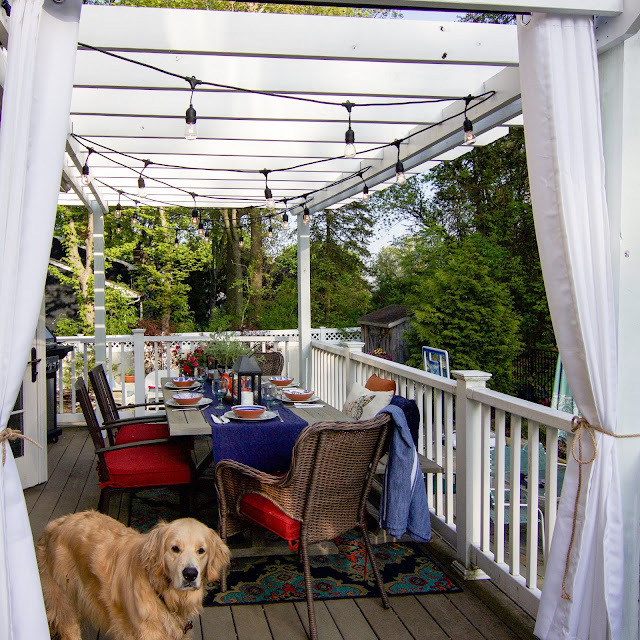 We have a covered patio, but we need to go down a level to get to it which isn't ideal when serving a meal. 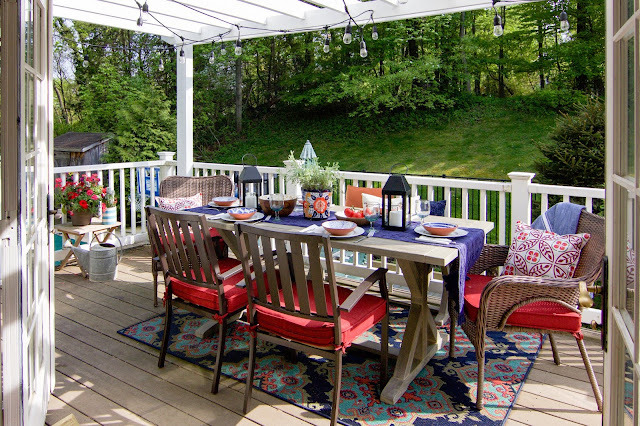 We knew that we would make better use of a deck on the same level as our kitchen. 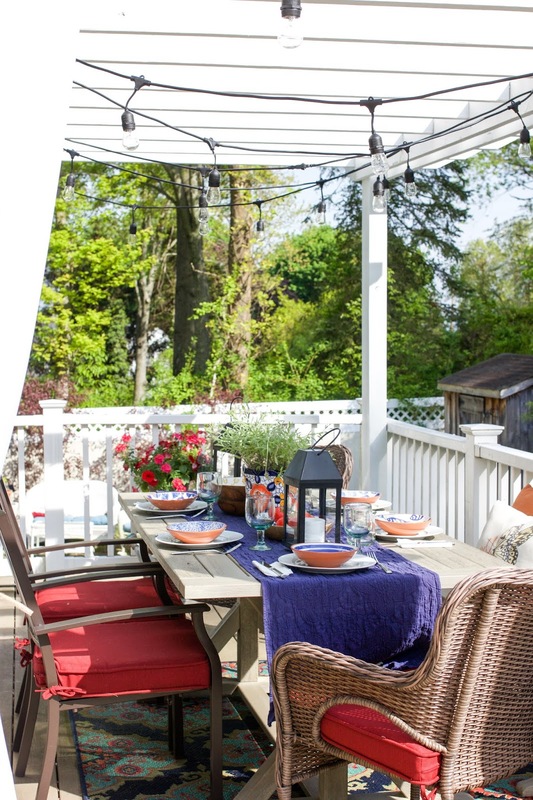 Problem is, we get direct sunlight on this deck right at dinner time. So the deck was seldom used. We added a cheap canopy one year with shower curtains hung from it to block the sun. It wasn't pretty but it got the job of blocking the sun done. 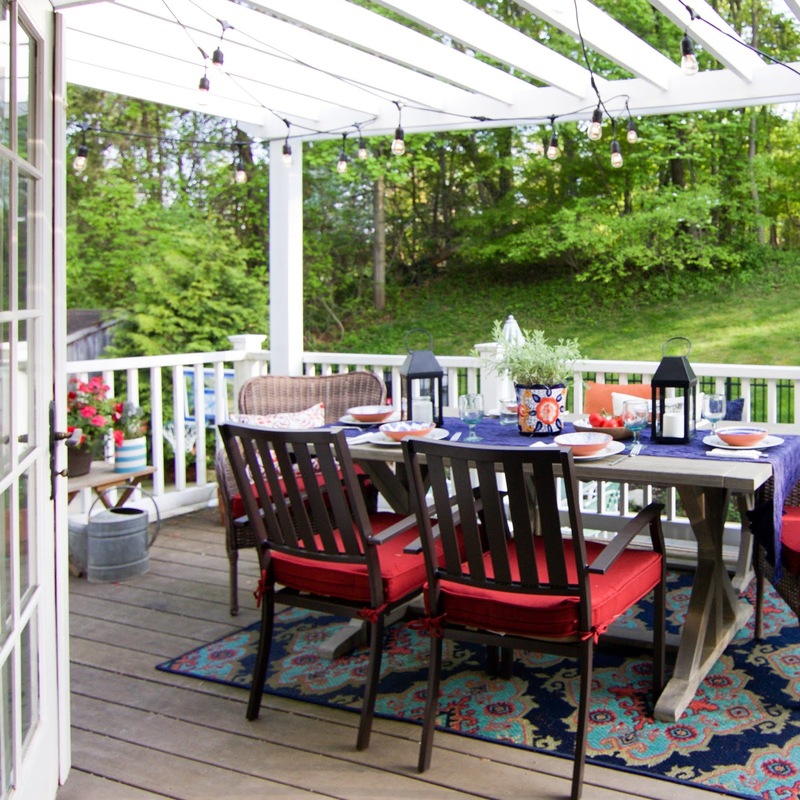 Then we started researching pre-made pergolas, but none seemed sturdy enough or were the exact size we needed. Billy kept saying we should just build one but other projects seemed to take priority. 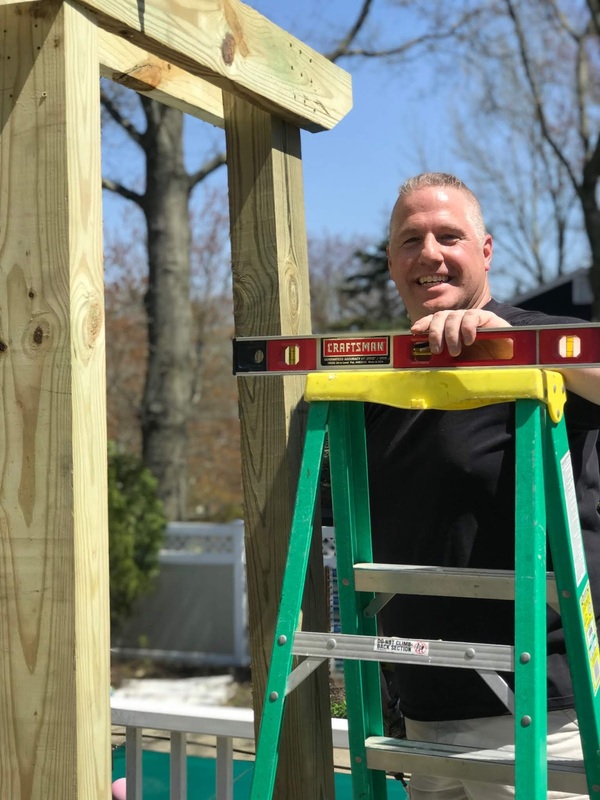 This spring, Billy took it upon himself to finally build us a pergola. I have to give him credit because he completely designed it, shopped for the wood and had it halfway built before I was really even on board with this project. He is very modest and keeps saying there was nothing to it. Thank you, Billy. He says his plan was to keep it simple. And cheap affordable. He used four 4x6 pressure-treated posts to build the main support and secured those with bolts to the deck from underneath. He then used 2x6's that he notched to create the top of the pergola. 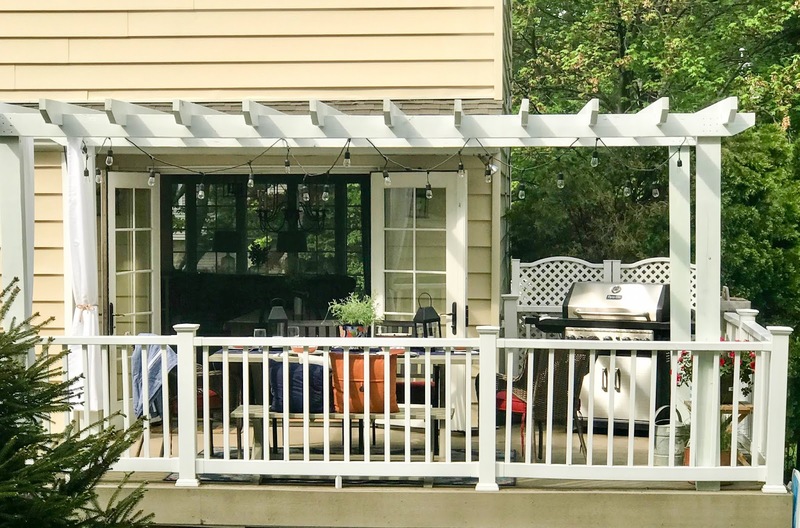 Our deck railing is vinyl so we painted the pergola to match the white in order to keep it all uniform. 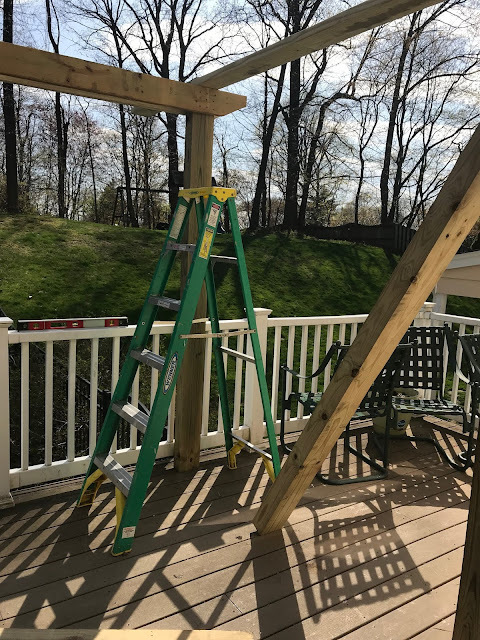 We plan to add another layer of thin strips of 1x3's to the top of the pergola for even more shade in the middle of the day when the sun is high. In the picture below, you can see the pergola from our backyard. We added outdoor curtains and hung them on an outdoor curtain rod to the side where the sun shines directly on the table in the early evening hours. We use a piece of rope to keep them secured during the day. This has worked beautifully! The deck is just off the french doors in our kitchen. 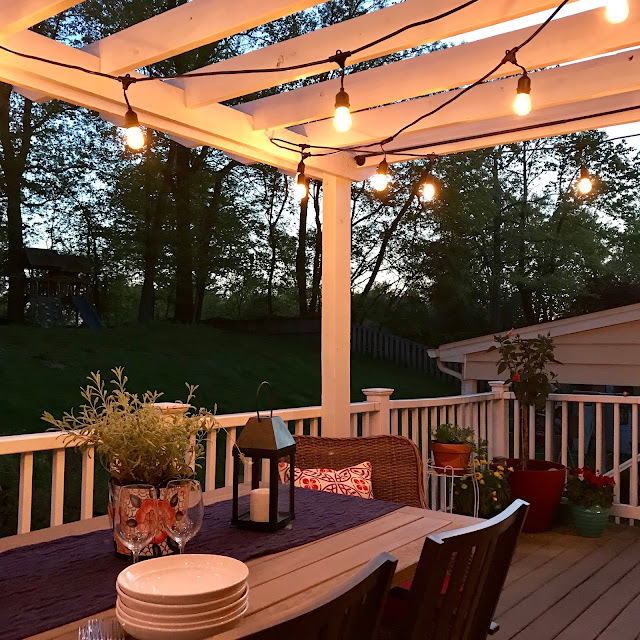 Adding the pergola really makes it feel like we added an entire new room to our house. The farmhouse style outdoor table, bench and chairs are from Walmart and they were my Mother's Day/Birthday gift from my boys. The outdoor rug, cushions and throw pillow are from Lowes. This deck also overlooks our pool area - you can see our pool shed and the basketball hoop in the distance in the pictures. Our pool isn't opened for the season yet. That's our next project to tackle this week. Aaahhh the joys of home ownership - seems the work in the yard never ends at this time of year. My very favorite part of this entire project is those patio lights hanging from the pergola. We have them on a timer and they come on at 7 every night - the time we eat dinner most nights. I can't help but smile when those lights pop on! I think it's going to be a great summer! Wow! That is just great! I love the lights. Great job! I was thinking about you just last night, happy to see this today! Wow! Outstanding. High five to Billy. This is beautiful and you will get so much use from it. And those lights would be my favorite too. How absolutely charming! Enjoy all the meals and fun times there! Hi Laura! So great to hear from you. I hope you and your family are well. You must be looking forward to summer too! Wow - it's gorgeous! I am so impressed that your husband has those skills. I have trouble getting mine to help me hang a picture! It really does look like a new room out there and I adore those lights! Maybe adding a pergola would be a good solution for us. We get full sun on our deck all day and only use it at dinner time. By then, most of the table is shaded. Ironically, we used it for the first time last night. I couldn't pass up an opportunity to enjoy that gorgeous day we had. I guess we are back to rain later today...but more sun later in the week. Enjoy that beautiful new space of yours! Beautiful! 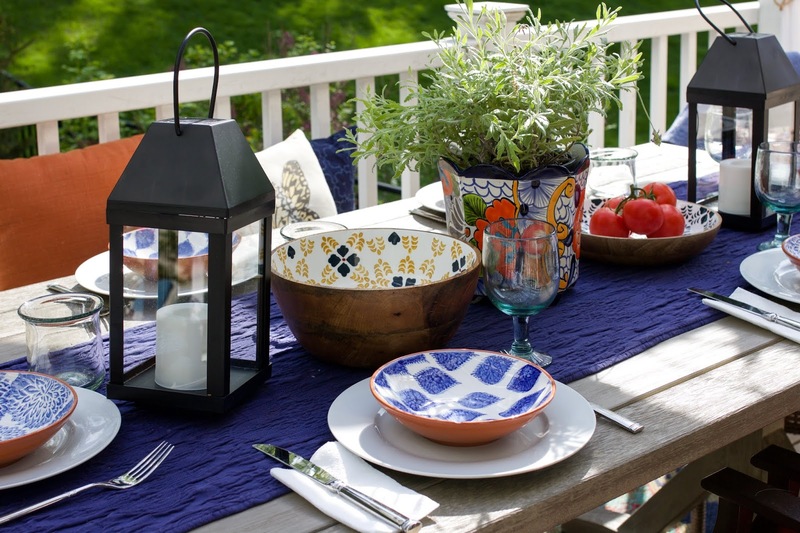 What a perfect spot for dinner, it looks amazing. So happy to see a post from you, I’ve missed seeing your beautiful home. Enjoy that new room! Love love love this Courtney. Looks beautiful. What a fabulous space Courtney. And, Billy did a great job. 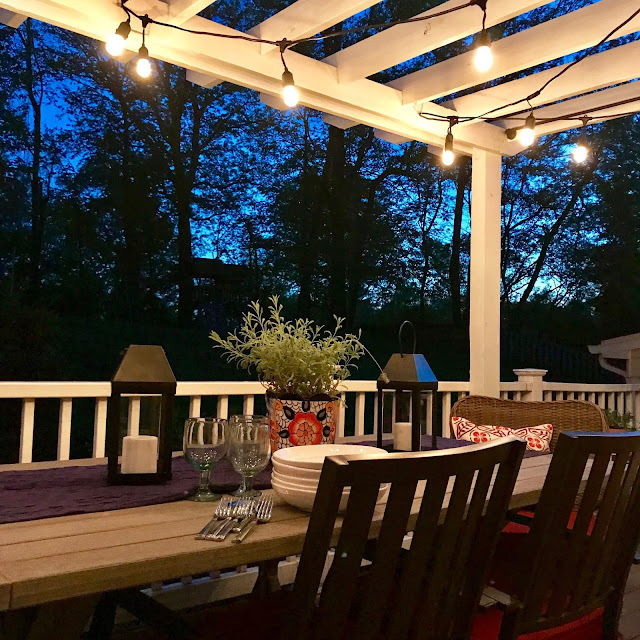 We have a similar pergola over our hot tub. We actually need to redo it soon as over the years it has seen its fair share of the elements. I love the idea of adding the curtains and lights. Oh my goodness!!! It's just perfect!!! I know you will enjoy this area to the max !!! Congrats to the Hubs!! What a great space, Courtney!!!! Billy did a fantastic job, definitely way better than anything you would buy! I was wondering how much shade a pergola would give you, but with the curtains I guess that solves the problem! That turned out beautifully! I read everything you post. I think you have great style, and I always scroll through to find a golden! It turned out beautifully, Courtney! The lights add wonderful ambience, too! I know your family will love it! 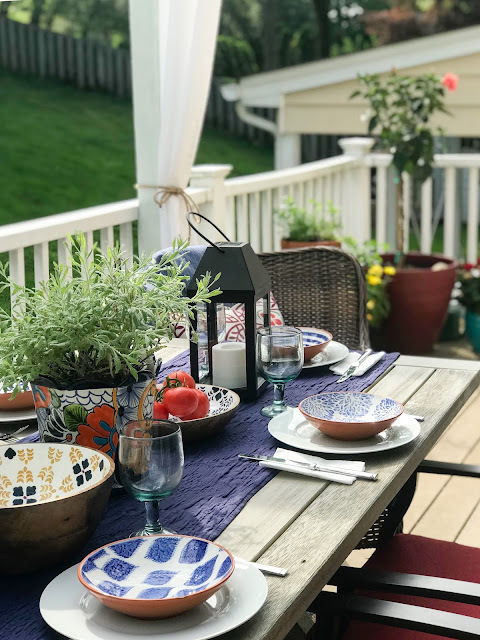 Wow, this is a really beautiful addition to your deck and the way you have decorated it is lovely, too!! We have a screened in porch upstairs, on our kitchen level, and I'd love to add some curtains to it, the way you've done. High-five to your hubby for a job well-done!! 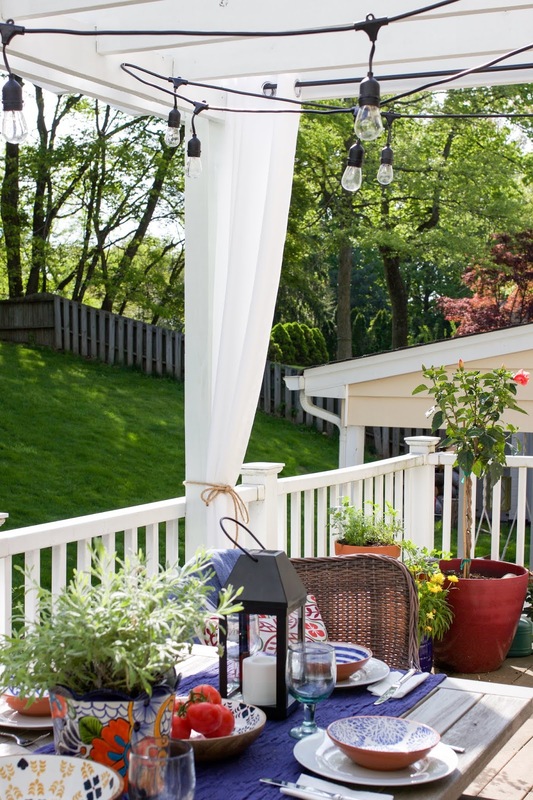 About 15 years ago I designed a deck the railing and a pergola. Our builder built it for us. And we have all vinyl plus composite deck flooring, Maintance free other then moping once a year in the spring. Our deck also faces the west and we could not use it. Because the sun was so bad. Thanks for the idea about the curtain.